"Billiard Personal Checks" product is already in your cart. For the billiards lover, Billiard Personal Checks are the ideal choice. With four high quality images on borderless checks, it is easy to reflect upon the strategy, the fun, the suspense, and the glory that comes with a game of billiards. 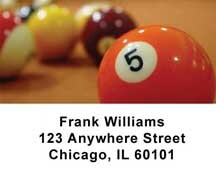 When using Billiard Personal Checks to pay the bills, you are simply brought closer to the game. Colorful close-ups of the billiard balls and angles that can be achieved by only the best photography make these checks very happy, but fantastic for the serious billiards player or spectator. Billiard checks are simply unique and they are affordable for the quality.